On October 3, 1994, the Basque TV series Goenkale premiered. It would go on to run for 3,708 episodes, finally coming to an end on December 28, 2015. It became the most watched show on the Basque-language channel ETB 1 and one of the most popular shows of all time for EITB, the Basque public broadcasting service. Set in the fictional coastal town of Arralde, the soap opera followed the fortunes of the town’s inhabitants and several emblematic locales such as the Boga Boga bar, a popular local bakery, a video store, a gastronomic society, and the local police station, all centered around “Goenkale” or Upper Street, the principal street in Arralde. It was originally scheduled to run for just three months, but its immediate success led to it being renewed. With episode number 3000 on July 5, 2010, it became officially the longest running TV series in Spanish broadcasting history to date, and the second longest-running show on European TV. See a report on the show here. Photo taken from the Eitb website. 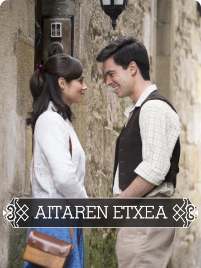 Aitaren etxea (The father’s house) is a TV show set in the 50s in a small coastal Basque town that goes by the fictitious name of Etxegi. The idea behind the show is to portray how hard life was in the Basque Country after the Spanish Civil War. The impossible love story between the mayor’s daughter, Irene, and Martin, a country boy, will reflect the open wounds that still exist after the fratricidal civil war between the “winners” and the “losers” in the conflict. If you want to see the first episode (in Basque and some Spanish) click here. On a related theme, War, Exile, Justice, and Everyday Life, 1936-1946, edited by Sandra Ott, explores the impact of war over a decade in Europe (including the Basque Country) in the 1930s and 1940s.